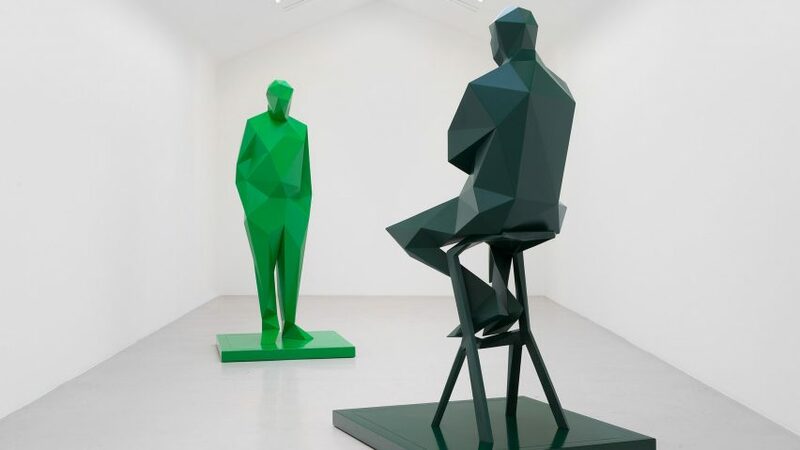 French artist Xavier Veilhan has created two new sculptures of Richard Rogers and Renzo Piano, which are set to be permanently installed across from the architects' iconic building, the Centre Pompidou. The sculptures are variations on pieces in Veilhan's Architects series, first exhibited at a private viewing in the Palace of Versailles in 2009. They will be exhibited at Galerie Perrotin in Paris before they are erected on Place Edmond Michelet opposite the Centre Pompidou. Like the original sculptures, Veilhan's new creations are made from stainless steel and have a faceted surface, but vary from the originals in their size and colour. The new works are painted in greens tones to reflect the colour scheme of the Centre Pompidou at the time of its construction. For their public installation, the sculptures will be placed on pedestals, and measure up to five metres high. Architects are a favoured subject for Veilhan, who describes them as "contemporary heroes". "At first I thought about [sculpting] pop stars, politicians or famous actors, but I realised that I didn't want to celebrate other people than architects, who I consider to be contemporary heroes," Veilhan told Dezeen. "Renzo Piano and Richard Rogers are very important architects of the 20th and 21st centuries. In their work, one can find a technical feat and an idea of modernity based on technology, as well as the humanist ideas developed in the 1970s, that they have put into practice through their buildings. The Centre Pompidou is an obvious example." Built in 1971, the Centre Pompidou is one of the French capital's most renowned contemporary buildings. Its famed inside-out aesthetic locates its colour-coded piping on the outside structure – which, internally, keeps each of its ten storeys column-free. British architect Rogers and Italian architect Piano worked together on the project after being awarded the contract by a panel of jurors that included acclaimed modernists Oscar Niemeyer, Jean Prouvé and Philip Johnson. Forty years has passed since the Centre Pompidou was first opened. In creating a new set of sculptures, Veilhans intends to comment on the impact that time has on places and people. "There is both the question of time in the life of these architects and their buildings, and the question of time that has elapsed since the sculptures were created in 2009," Veilhans said. "The main idea is that these well-known architects – the 'starchitects' – although powerful, admired and in great demand, are exposed to the contingencies, and political circumstances that can annihilate their work in a few seconds." The building, situated in Paris' Beaubourg area, has undergone a series of refurbishments, including an €88 million (£80 million) renovation between 1998 and 2000. Earlier this year, the museum announced plans for a two-year renovation to celebrate the building's 40-year anniversary. Following the completion of the Centre Pompidou, Piano, now 79, went on to found Renzo Piano Building Workshop in Paris and Genoa and complete projects that include the Shard and the Chicago Art Institute. Rogers, 84, runs the London-based practice Rogers Stirk Harbour + Partners. The pair both feature in this year's Dezeen Hot List of most read-about figures in the architecture and design industry, with Rogers coming in at 56 and Piano at 22. Smarin designs sunloungers that are "Hockney-universe friendly"